Lying in a hospital bed in Thailand, his legs atrophied to the point that they were the size of his wrists, 22-year-old Colin O’Brady told his mother that when he was healthy again he would race his first triathlon. She humored him, wanting to believe it was possible, all the while hoping for a more modest goal: that her son would walk again. A talented athlete and native of Portland, Oregon, O’Brady had been recruited after high school for both Division 1 soccer and swimming. He chose swimming and was a member of Yale’s varsity team for four years, competing in the 100- and 200-meter breaststroke. After graduating in 2006, he had no plans to continue the sport seriously. He worked and saved up his money, and the following spring, he began what was meant to be a year-long backpacking trip around the world. The trip ended abruptly on January 14, 2008, on a fire-lit beach on the island of Koh Tao. O’Brady had joined other tourists in a hotel’s fire games on the beach, jumping over a 20-foot rope soaked in kerosene and set ablaze. At the time, the game seemed innocent and simple. But he tripped on the rope, wrapping it around his legs and splattering the kerosene over the rest of his body. One second he was skipping rope, and the next he was facedown in the sand engulfed head to toe in flames. An immediate, instinctive sprint into the ocean extinguished the flames and perhaps saved his life, but the damage had been done. Blackened skin hung in ribbons down his bloody legs. 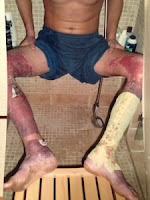 He’d suffered second- and third-degree burns to 22% of his body, primarily his legs and feet. Koh Tao, a small island off the southwest coast of Thailand, had only a basic nursing station. Given penicillin and morphine, O’Brady waited for 12 hours before he could be transported by pickup truck and the morning boat to nearby Koh Samui, a larger island. 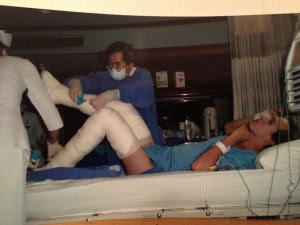 The hospital on Koh Samui was similarly ill-equipped for serious burn injuries, and after about a week, he was transferred to a larger hospital in Bangkok. There, a month passed before he took a single step, and doctors told him he might never regain the full range of motion in his legs. At his bedside, his mother kept him busy talking and thinking about what he would do when he went home. O’Brady focused on the idea of his first triathlon, visualizing himself whole again. After his return to the U.S., O’Brady took a job in Chicago as a commodities trader. For roughly a year following the accident, he focused on rehabilitation and learning how to walk again. Scar tissue had formed over his joints, and the muscles in his legs had all but disappeared after the extended bedrest. The new, fragile skin couldn’t be exposed to the sun, and any impact would cause it to break open. In the winter of 2009, he joined a nearby gym and set his sights on the Chicago Triathlon that August. His goal was simply to finish the race as best as he could. He started his post-accident training with casual jogs and spin classes. Though his soccer and swimming background worked in his favor, all-out 10ks and 1500-meter open water swims were another can of worms, and he’d never raced a bike before. 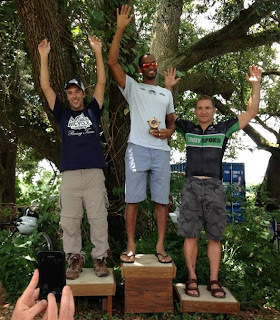 In May, he transitioned to more serious and specific triathlon workouts, and two months later, on a borrowed time trial bike, he won overall amateur at a small sprint-distance tri in Racine, Wisconsin. The race, meant as prep for the Chicago Tri, qualified him for age-group nationals. Taking advantage of the unforeseen opportunity, he competed in the 2009 age-group nationals in Tuscaloosa, and his placing there qualified him for a spot on Team USA to compete at the 2010 world championships in Budapest. A week after racing in Alabama, he won the overall amateur title at the prestigious Chicago Triathlon. The immediate and unexpected success was both satisfaction and a taste of something more, a new and tempting possibility. Before the string of wins, O’Brady had been talking to his mentor Brian Gelber, who runs a large trading firm in Chicago, about other jobs in trading and finance. But after the Chicago Tri, Gelber asked O’Brady whether he was considering professional triathlon. “In the early stage of any pro career, you need someone to believe in you from the beginning, and Brian was that guy for me,” O’Brady says. Encouraging O’Brady to train full-time, Gelber became his sponsor. Within a month of winning the Chicago Triathlon, O’Brady was moving to Australia for a six-month training block in the Southern Hemisphere. Growing up, O’Brady had often dreamed of the Olympic Games. But for O’Brady, like many student athletes in the U.S., the end of college seemed to signal the end of the road for his athletic career. In some ways, after so many practices and laps in the pool, it was a welcome one. 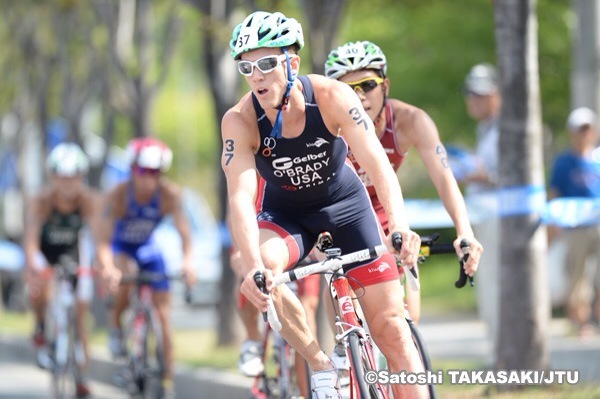 Triathlon, with its three different disciplines, made training fresh and exciting again, and also rekindled his childhood dream of competing in the Olympics. ITU, or draft-legal, triathlon was the natural choice of discipline within the sport. ITU triathlon is another world, a world many amateur triathletes never see. In the U.S., draft-legal races for amateurs are very rare, and the ITU series is limited to professionals. The general format of ITU may be the familiar Olympic distance (1500-meter swim/40K bike/10K run), but in most other respects, it’s very different from non-drafting triathlon, rewarding a separate skill set. A good swim time is crucial because an athlete must make the front group on the bike to contend for the win. A speedy transition is also important. Make a mistake at any time—drop your chain, fumble with your helmet or shoes, botch a mount or dismount—and those few seconds can mean the difference between 4th and 40th place. Typically, riders work together in a rotating paceline for the 40K bike, keeping speeds high, especially when a known threat doesn’t make it out of the water fast enough. From the bike, the front group starts head to head for the 10K run. ITU is an international circuit. Athletes represent their countries, wearing their national jerseys, and the maximum number at the start line is 75. With the small number of competitors racing together in every remote corner of the globe, O’Brady says the ITU scene is a kind of “traveling circus.” Your competitors are your travel companions and your friends, but at the end of the day, you also want to beat them. ITU athletes are ranked by a complicated points system, one that even the pros don’t always fully understand. 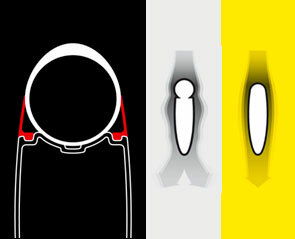 There are three levels of the professional circuit, and to race at each higher level, an athlete must have earned the correct number of qualifying points at lower levels. In turn, races at the higher levels are worth more points, which means that the top athletes in the world focus on the highest of them, the World Triathlon Series. Points carry over for 12 months, and overall ranking determines an athlete’s eligibility for the Olympics. Unlike swimming or track and field, in which a time standard might qualify an athlete for the Olympic trials, in triathlon the Olympic trials are races in the World Triathlon Series; an athlete must have the points necessary to be one of the six or so Americans on the start line. It’s a system that rewards consistency above any one breakthrough performance. Working one’s way up the ITU ladder can take several seasons. O’Brady is currently racing a mixture of Continental Cup and World Cup races, with the goal of primarily racing the World Triathlon Series in 2015 and 2016, and qualifying for the 2016 Olympic Games. Three and half years after O’Brady’s headlong dive into triathlon, Brian Gelber remains his primary sponsor and personal mentor, and O’Brady says he finds Gelber’s advice invaluable. The psychology of trading and the psychology of trying to succeed in sport offer a surprising number of parallels, O’Brady says. In many ways, it’s the same competitive, cutthroat environment. There’s no “clocking out” at the end of the day, however. “Everything you do outside of the actual swimming, biking, and running still has an impact on your performance and your job,” O’Brady says. “It’s something that, over the few years now that I’ve been doing this, that I’ve adjusted to and am used to, but I remember the very strong difference when I was trading energy futures, for example, and the market would close at 4 o’clock. ITU triathletes have to train as hard as pro athletes from any other sport, but without the three to nine figure salary. Though athletes race for their individual country, the level of support varies. USA Triathlon sponsors only a small selection of the top athletes, and most competitors rely on personal sponsors to fund living expenses and travel. Triathletes who focus on non-drafting events can do very well racing domestically, but for ITU athletes, as few as four races a year are on U.S. soil, not enough to advance in world ranking. The majority of races are an expensive international plane ticket away. In addition to being a significant barrier for entry to the sport, the financial burden makes it a constant and very stressful gamble, where carefully laid, expensive plans are easily laid waste by random events. O’Brady often travels with his girlfriend and manager, Jenna Besaw, taking advantage of homestays when possible. “From the end of June of last year through the first of this year, I think we’ve slept in 55 different beds, be that hotel rooms or different places,” he says. O’Brady says he still considers himself to be in the developmental curve of his professional career in triathlon, and learning to focus on what works for him versus what works for another athlete has been key. Though it’s difficult to avoid in an environment where everyone’s looking at everyone else’s training plan to find the magic ticket for success, trying to keep up stride for stride in training volume can quickly lead to injury and overtraining. This year, O’Brady and Besaw were in Austin from January to June. The previous two years, O’Brady trained in Australia, where it was summer. Similar to Boulder, Colorado, in the North American summer, Australia is often the “who’s who” of triathlon that time of year, O’Brady says, and the local race scene is in full swing. He says he was looking for something different—a place with good facilities, weather, and athletes, but where he could be more relaxed and self-contained before the crux of the season began. Winter training was a success, and O’Brady and Besaw say they’ll be coming back next year. They offered special thanks to Brian Lieb (and his awesome dog, Bode) for sharing his home with them, and to Pure Austin for their support, as well as other current sponsors Gelber Group, Primal Wear, MegaFood, Kiwami, Swiftwick, Athlete’s Lounge, and Upper Echelon. O’Brady said he especially enjoyed the swimming options in town—from Pure Austin’s open water facility at Quarry Lake to the UT Masters swim workouts coached by Olympic gold medalist Whitney Hedgepeth—and the Lady Bird Lake trail. ATC’s Saturday ride was another highlight, he said, and Kendal Jacobson was the best sports massage therapist he’s ever had. Escaping Austin’s notoriously hot summer months, O’Brady is currently training in Kauai, Hawaii, and racing all over the world. Upcoming races include the Brazil Continental Cup (Sept. 29), Mexico World Cup (Oct. 6), and Puerto Rico Continental Cup (Oct. 13). Read more about his adventures on his website and blog, http://colinobrady.com/. Mavic's CXR line takes a unique approach to wheel shape. Unlike the rest of the industry (which somehow simultaneously adopted "U" shaped rims), Mavic uses a combination of custom tires and a "blade" that fills in the space between tire and wheel to have complete control of the entire wheel-tire shape. 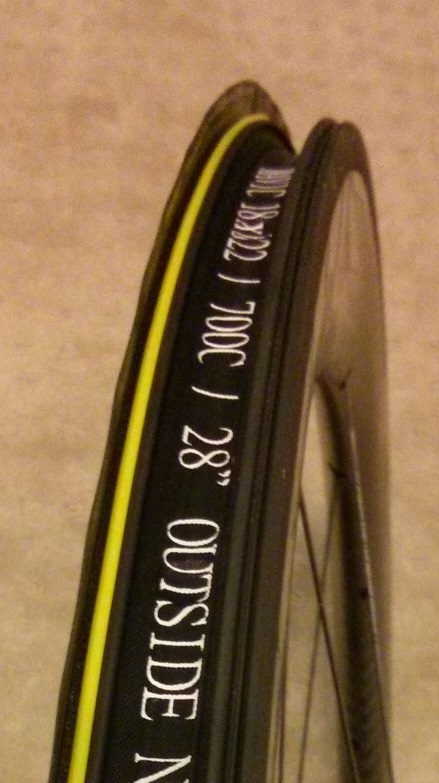 If Mavic's wind tunnel results are accurate, this gives them a sizeable aero advantage over other wheels. Downsides to this approach include a reliance on Mavic's custom tire, which may or may not have great rolling resistance to go with its excellent shape. 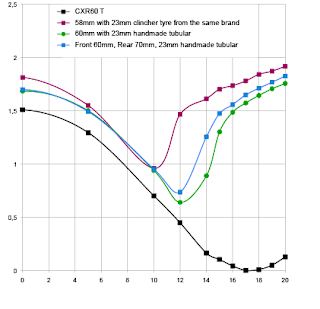 If the rolling resistance is not good, it can more than offset the aerodynamic advantage. This is of particular concern in the tubular versions of the wheel, as the rolling resistance is not very good with that tire. 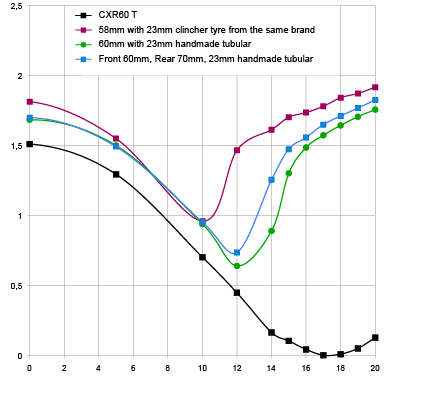 Tom Anhalt has measured the rolling resistance of the Mavic clincher tire and thankfully found it has excellent rolling resistance, details here. The other downside is dealing with the blades. The CX01 blade snaps into the rim after you install the tire. The process is quite simple, but would be an extra step to deal with when changing flats on training rides. 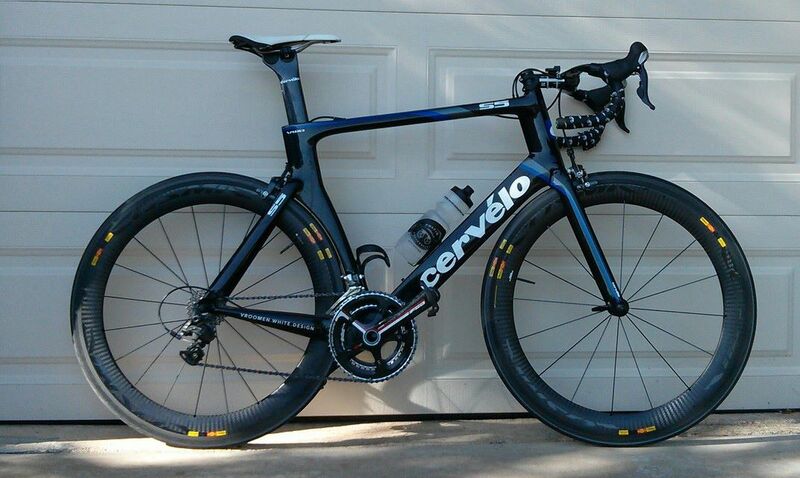 On the other hand, you don't have to use the blades on training rides; you can save them for race day. Additionally, you need to take care that the brake pads are adjusted properly, or they could grab the blade when you apply the brakes. There have been a few reports of blades coming undone during bike races, possibly due to contact with other bikes. They can then get wrapped up in your hub and end your race. The blades might best be saved for time trials and triathlons, where bike-to-bike contact is rare. However, given the good rolling resistance of the Mavic clincher tire you may want to stick with it, especially up front. The braking surface on the clincher version of these wheels is a special metal surface that Mavic calls Exalith 2. It has a directional texture, and is designed to work with a specific Mavic Exalith brake pad. The braking power and modulation on this is excellent, especially in the rain due to the texture feature. Our resident Cat 1 cyclist tester said she thought it felt better than her standard aluminum rims. While other racers get stressed out if there is rain in the forecast, you can remain calm and focus properly on your race, a nice advantage. The downside is the necessity of using the Mavic Exalith brake pad, which you may have to swap on and off if you use other wheels for training. In a pinch, other pads will work fine, but the Exalith surface seems to tear them up pretty quickly. You also must take care to orient your front wheel in the proper direction for optimum braking. We did test the braking with the wheel installed the wrong way around, however, and it still worked well. The tubular version of the wheel uses a more traditional carbon braking surface. Road testing revealed what we expected. Mavic wheels are very well built! 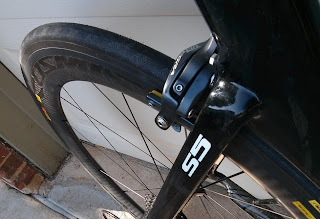 There were no issues or drama under hard cornering or acceleration, and no flexing to cause the rear wheel to rub when pushing sickwatts up steep hills. 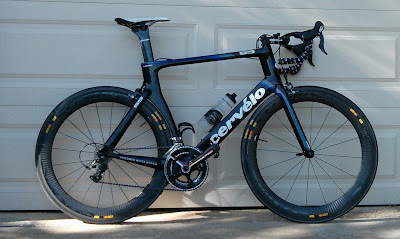 We tested the wheels in a Cervelo S5 and a Litespeed C1 and found no clearance issues on either. 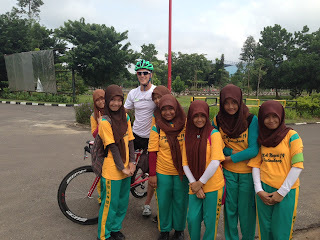 Our resident Cat 1 cyclist Kat Hunter gave them a thumbs up, noting the exceptional braking performance. Meanwhile, our Cat 3/triathlete was able to decimate the local Strava scene in his neighborhood. Testing during windy days showed the wheels to be stable and predictable. 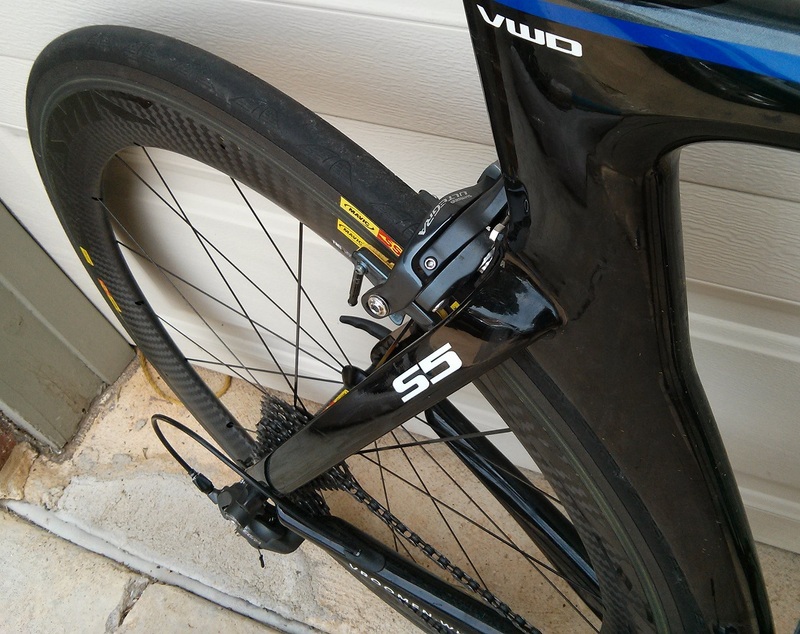 The construction of the clincher wheels is similar to HED Jets, with a carbon fairing attached to an aluminum rim. Mavic also applies a carbon fiber "cap" on top of the metal rim, however. The only exposed metal is the black Exalith braking surface and the black spokes. I'd like to think my last post, "Stepping Out of Your Comfort Zone," inspired my wife, Lauren, to take the plunge into the bath-warm waters of Decker Lake this past weekend, but in reality I think she was just tired of spectating. Lauren has been a great supporter and onlooker at races over the last few years, and on Sunday it was my turn to encourage her and embrace the cheerleader role. With the help of Thunderbird Energetica, we were able to get a last-minute entry into the Couples Triathlon. Once we actually signed up for the race, reality set in that we would need to get Lauren training and set up with the proper equipment to complete the race. I thought the best way to get her motivated to start training would be to get some new toys for race day. A trip to Austin Tri-Cyclist for a quick bike tune-up and a new Zoot tri kit did the trick, and Lauren was feeling confident and ready to race. Of course, there was still that small matter of training, but we didn't let that ruin the excitement of new clothes and a clean bike. A few swims, rides, and runs with the laziest vizsla in town (our dog Tucker) and Lauren was starting to feel ready to take on the challenge. Race morning came quickly, and my usual nerves were replaced with feelings of a somewhat relaxed excitement knowing I had a different role for the day. The plan was to swim my own race, then meet up with Lauren at the swim exit to complete the bike and run together. We arrived at Decker Lake, and I watched Lauren meticulously set up her transition area, offering tips when I could. We made sure she had everything she needed before heading out for a short warm-up jog and dip in the lake. I was impressed with her calmness. I'm usually a nervous wreck up until the gun goes off, but Lauren's demeanor was cool and calm. It wasn't the easiest of swims due to the blindingly bright sun coming up over the water and several waves of swimmers sprinkled along the course. I felt a little sluggish at first but came around and accomplished my goal of leading our wave out of the water. A few short minutes later and Lauren came running out of the water looking like she'd done this a thousand times. We made our way into transition and slowly made our way out on the bike. It wasn’t my fastest transition – I think my T1 time of eight minutes rivaled the slowest of the day – but it was Lauren’s first ever. The bike was the big unknown for Lauren. She had only done a handful of rides, and she was on her pretty heavy hybrid bike. I told her not to worry about her bike and to keep her legs turning over at a comfortable tempo. I must admit, this wasn't the easiest of courses for a first timer. The course had a few good hills that were even more difficult on the heavy bike. Lauren did a great job of keeping an even pace and taking in fluids to prepare for the run. I tried to encourage her when I thought she needed it – like when she commented, “Everyone keeps passing me!” –and kept my mouth shut when she probably didn't want to hear from me. 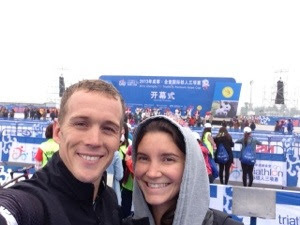 It was fun to cheer on other athletes along the course and take in the race from a different view. They don't call the run off the bike a brick for nothing. Lauren's legs were feeling heavy, but I let her know that we were almost done. We immediately started passing people on the run. I'm not sure if it was the "I need to pee" feeling or if she was just ready to be done, but Lauren was cruising. We did make a quick port-a-potty stop at mile two and had a few moments where walking sounded pretty dang good, but we kept running all the way to the finish line. We crossed the line together and I could see the sweet feeling of relief and satisfaction on Lauren's face. I was proud of her effort and happy to hear that she had fun along the way. We may not have placed as high as Lauren would have liked, but that's what keeps you coming back for more. We enjoyed the finish area amenities and caught up with friends before packing up for the day. On the walk back to our car we heard a shout. "Where did you get your outfit?" asked a woman from a passing car. 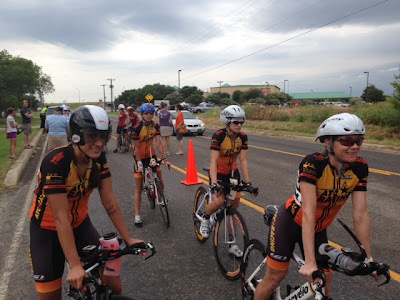 With a smile, Lauren said, "It's Zoot, from Austin Tri-Cyclist." I have a sneaking suspicion that that little compliment made her day even more than finishing the race. 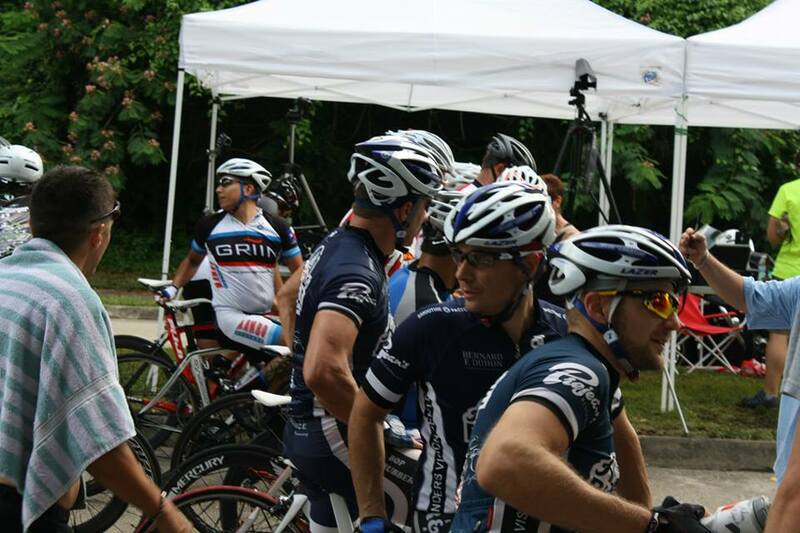 Vuelta d’Acadiana was my first non-Driveway race in four months. I had missed most of the spring road season but got back on the bike in May, and by late June, my form had started to come around, and I was ready to race. Unfortunately, there aren’t many options in June and July. I saw the Vuelta d’Acadiana listed on TXBRA, but it was in Louisiana. I tried to get some friends interested in going down there with me but had no takers, so I couldn’t decide whether to go. I finally made the call on Friday afternoon, didn’t leave until almost 8, rolled into my hotel at about 2:30, and went to sleep at 3:45...A.M. 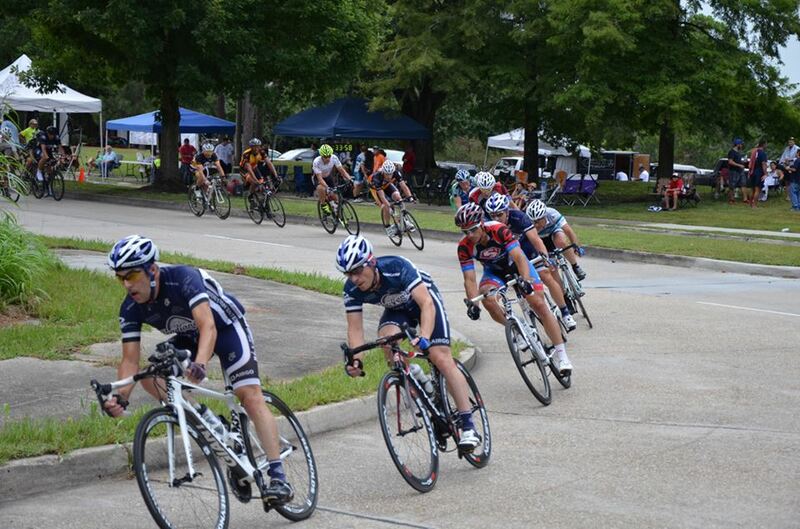 Acadiana is a typical three-stage race featuring a TT, a crit, and a road race. The field was made up of roughly ½ Texans and ½ Louisianans. The TT started Saturday morning, so after a couple hours of sleep I headed down to the start. I still hadn’t decided whether to do the Cat 123 race or the Masters 40+ race, and I thought I would check the numbers and decide once I got there. The plan was to get there early, because one, I hadn’t registered yet, and two, the TT was only 4.3 miles, so a long warm-up was extremely important. Well, my plan almost worked—I got there in time to do a good warm-up, but as I was parking, I realized I left my skinsuit in the hotel! My choice seemed to be to do the TT in normal clothing or to rush back to the hotel (25 minutes away), get my suit, and do the TT with no warm-up. I chose the latter option, and figuring I would have no time to warm up, I chose the Masters race, thinking the field would not be as deep overall. Fortunately, start times were pushed back, but by the time I pinned my number and got my TT bike ready to go, I only had about 10 minutes to warm up, nowhere near what I’d wanted. Oh well. I had no idea what to expect in the TT. There was a time when I was a good TTer, but I hadn’t done a good one in a few years, mostly because I rarely train on my TT bike anymore. Somewhere along the line I lost the motivation to do rides by myself, especially those involving hard efforts. I hadn’t touched the P3 in a long time. I didn’t even do a warm-up ride on it in the days leading up to the race, so I hoped everything was still working properly. I basically just oiled the drivetrain and hopped on, hoping I could get by on fitness, though a longer TT would have suited me much better. With the lack of a good warm-up, I decided to start conservatively, but I was still extremely uncomfortable. I gave it all I had on the way back and it seemed to go okay, as I caught my 30-second man. That gave me a bit of confidence, and I figured I finished in the top half. I wound up 6th, one place out of the money, but with 10 points for the GC. I was only 25 seconds out of 1st, which I was thrilled with under the circumstances. The crit was that evening, and I made sure I got a suitable warm-up. I also made sure I knew the race numbers of the guys ahead of me. A few guys from my old team were there, which was nice, as I figured we might help one another if need be. There were about five primes during the race and one hotspot sprint for GC points. The race hosts, Acadiana Bicycle Company Racing (ABCR), had the biggest team and were in 2nd and 4th after the TT, so they did the majority of the work in the bunch. I popped off the front twice to bag cash primes, and I was surprised by how easy it was. Both times I had such a big gap that I was able to soft pedal the last few hundred meters and put out very little effort. An Austinbikes rider went off the front and was away solo for a long time. He was 3rd on GC, and I was happy for him to sit out there, as he never got more than 20 seconds, and I was confident I could close the gap if need be. Unfortunately, this meant he scored top points in the hotspot sprint. I went off the front at the same place I had for the primes to score 2nd place in the hotspot sprint. I was surprised the group let me pick up the two points so easily, but I certainly wasn’t complaining. 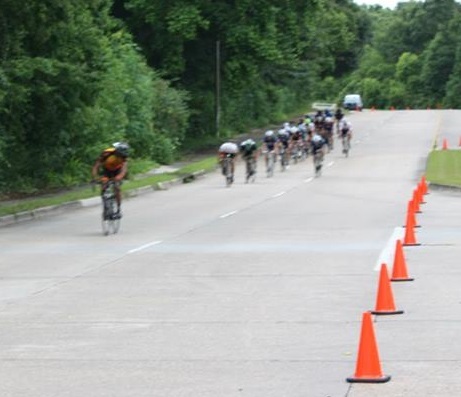 Just past the halfway point, the gap to the leader went down to about 10 seconds, and an Acadiana rider, Alex (2nd in the TT), bridged. The gap started to go out again, and another rider went really hard to bridge. 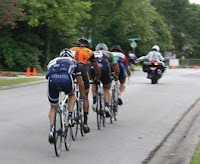 I took off after him, and we had a foursome containing 2nd, 3rd, and 6th on GC with about nine or ten laps to go. It was almost an identical scenario to the one I was in just two days prior at the Driveway where I finished 2nd. We worked well together and eventually extended our lead enough that we were guaranteed to finish 1st through 4th. Again, I finished 2nd, but I finished ahead of the two guys who were ahead of me in the TT. So, that meant in 10 days, I finished 3rd, 2nd, and 2nd in mass start events. I was ready to finally win something, and I texted two people that night that I was going to win the road race, not out of any disrespect for my competitors, but to put pressure on myself and for motivation. Going into the road race, Alex (ABCR) was in 1st, Charlie (Austinbikes) was three points behind him, and I was one point behind Charlie in 3rd. The TT winner, Donald, was one point behind me. That basically meant that if any of us in the top four won, then we would win the overall. 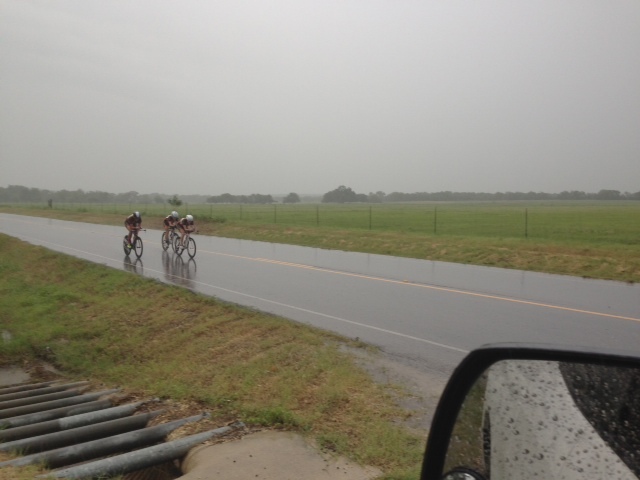 As soon as we started racing, it started raining. It did this off and on during the race, sometimes quite hard. ABCR controlled the race once again. They had the leader and kept him near the front, went in almost every move, and pulled back anything too dangerous. I tried not to do too much work, and the one time a dangerous move went with Alex in it, I bridged halfway, and when I realized a couple of guys came with me, made them complete the bridge. It was too early, and eventually we came back together. About halfway into the race, the pack got fragmented into small groups as the pace went up on a section of the course with lots of turns. 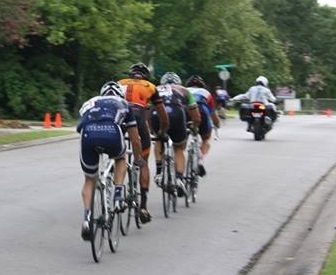 I was sitting too far back in the bunch, and I latched onto a guy as he jumped from group to group. At one point he seemed to slow, and I encouraged him to keep going until we caught the front group. I stayed on his wheel until we reached the front group, and then I attacked as I figured it was the perfect time, since guys were lined out and fragmented. A couple of guys latched onto my wheel, and soon there were three of us with a significant gap. One of the guys was the the TT winner, and the other was Alex, who was sitting in 1st on GC. A perfect group—good horsepower, and ABCR would probably control the group behind. Still, we had about 20-25 miles to go. Fortunately, we worked well together, and before long we were completely out of sight. Things were simple now—I needed to win the race to win overall. Actually, it was the same scenario for all of us, but at the time I thought Donald was a couple of points further back, and I didn’t realize he would also win GC with a road race win. I also didn’t know at the time that he was the two-time defending champ. For the first half hour I noticed Donald’s pulls were much stronger than Alex’s, and Alex seemed to be suffering a bit. Later, Donald’s pulls grew weaker and shorter, and Alex’s got a bit stronger, but I had no idea if there was any bluffing going on. I knew eventually I would attack after one of Alex’s pulls. Donald had huge legs, and I didn’t want to take a chance of losing yet another sprint. I needed to wait until the last moment, but I didn’t want to wait so long that Alex was anticipating it and waiting on me. I attacked just after the last feed zone with two or three miles to go, just as Alex was pulling off. I looked back and they were trying to get across to me, but it wasn’t happening. I got a decent gap, but the road was straight and wide open and there was a solid headwind, which I hadn’t anticipated. That last couple of miles wasn’t fun, as the headwind was brutal, and I could see them there about 150 meters back. The elastic never broke, so I couldn’t let up. When I finally saw the flag signaling 1k to go, it was a great feeling, because I knew once I was there, no one would catch me, as I would cough up a lung staying ahead if I had to. Right about that time, I noticed the gap was coming down. Turns out it was Donald coming after me solo. He was coming strong, but I was able to slow it down with about 200 meters to go and coast in for the win. Success! As an added bonus, my former teammate Larry was 2nd in the sprint from the remaining group and finished 5th—a good day all around! I’d definitely recommend the race. It was well-organized, ABCR were great hosts, and Lafayette is a pretty little town. The courses were also nice, if a little flat for my liking. I plan on going back next year for sure. Many thanks to Acadiana Bicycle Company Racing for the race photos! Check them out on their website, http://abc.ccracinginc.org, or on Facebook. My morale was shot going into Sunday's Team TT. 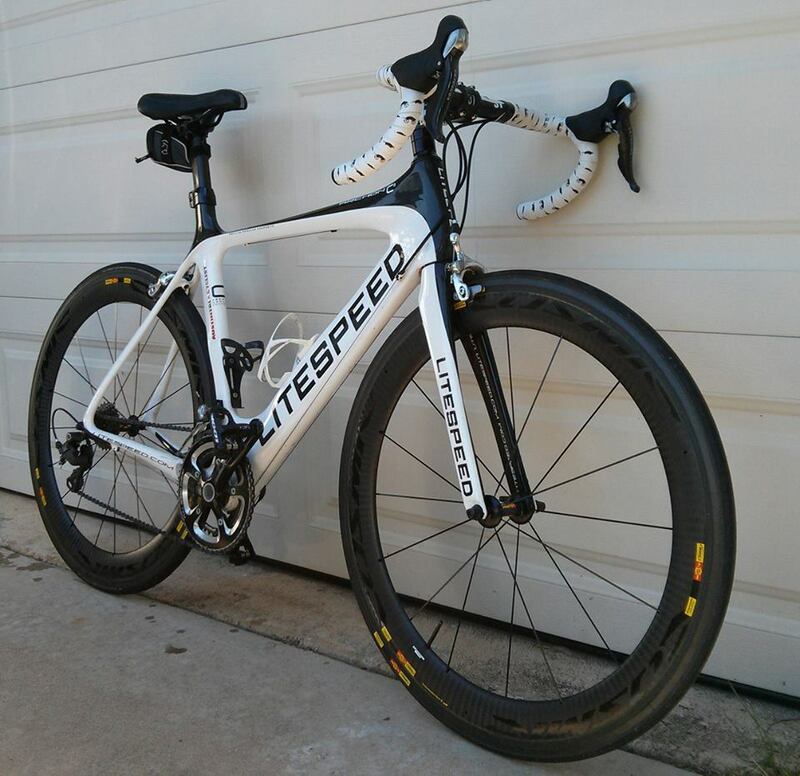 With the dark clouds of a disappointing individual performance looming from the day before, I reluctantly suited up, applied more chamois cream than normal, pumped up my tires to a hard 120 psi, and refilled my aero water bottle with the usual mix of lemon-lime Accelerade. 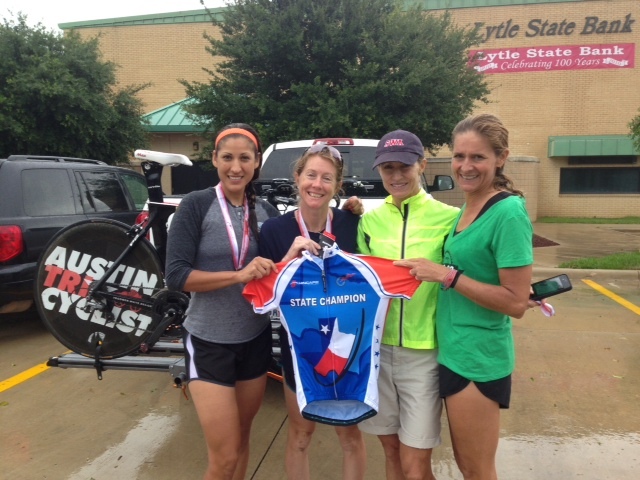 After a quick warm up, I found my teammates, Anne Flanagan, Marla Briley, and Anne Stevenson. We devoted plenty of hours to team practice and had a good strategy. My teammates would take their turn in the wind for 30 seconds each while I, because I am the biggest, would take longer, one-minute pulls at the same pace. Putting emotions aside became easier as we lined up to start. The team did not want me to get burnt out. Every bit of recovery between pulls makes a huge impact on overall speed; therefore, I lined up behind Anne S., as she is the next tallest, thus offering more of a draft. We took off and quickly formed a tight line. When it was my turn to pull, I stayed 30 watts above my average watts from the previous day's individual effort. 290-300 watts for one minute felt good. I drifted to the back for recovery. Feeling a real need for our team to not only win the Cat 3 title but to get the best overall team time for the women, I became anxious. I knew that Jubilee Subaru and Think Finance would bring their "A" game, so we absolutely had to do the same. Maybe we're not pushing hard enough, I thought. I believe I made the mistake of going out too easy, so subsequently, my watts shot up to 300-400 on each pull—not part of the plan. After drilling up a false flat, I heard Marla yell, "Gap!" The group fell apart, so I sat up until everyone was back on. I realized that I was hurting my team by failing to stay steady. I wanted to win so badly—instead of sticking to the plan we practiced, I let the mistakes I made from the previous day selfishly determine the way I rode. As I retreated to the back of the line, Marla remarked, "The second half will hurt way more." I eased off as we approached the U-turn, where both Marla and I forgot to get into easier gears. We mashed, up out of the saddle, up to Anne F. and Anne S. to regroup. Settling back into my saddle felt like trying to get comfortable on a bed of stabbing needles, so I did my best to tune out my body's longings for comfort. The pain went away when torrential rain began pounding out of nowhere. Winds howled and thunder boomed. Between the weather conditions and the fact that it's tough to hear anything besides the whooshing wind inside an aero helmet, we could barely communicate or keep formation. Rain? Really? It was almost impossible to see anything, especially when following a wheel closely. Rooster tails of nasty water flew into my mouth as I breathed heavily from mashing my pedals to fight the winds. It was after a few minutes when we regrouped and adjusted to the drastic change that an intense feeling of trepidation began to grow inside. I started thinking about my tire pressure, how slick my race tires were, and how much I was being blown around from my disc wheel. I started wondering how slick the roads were and whether we appeared visible to the oversized trucks that flew past. I will admit that I spent the first 10 minutes of rain clutching the grips of my base bar, bracing my entire core every time a gust of wind blew. I was inspired by Anne who, despite having the least experience on a TT bike, rode down in aero position the entire time! I trusted my bike, teammates, and skills enough to eventually get down because the relentless headwind undoubtedly impacted speed. Settling into my aero bars, I found that I had more control in the crosswinds than I did sitting up. Conditions blew apart many teams—we must have passed half a dozen dropped riders. Roads were flooded in some areas, with muddy water at least four inches deep. The final left turn was a bit tricky. I believe that was the point where we ALMOST lost Marla. I looked back after leading us through the turn fast and saw Marla at what seemed like a dead stop. We soft pedaled till she caught on again. "I'm not tired or anything—I feel great!" she yelled as she roared past. "I'm just scared!" "Don't be scared!" I shouted automatically. I thought about the very wet road race that was part of the Joe Martin Stage Race earlier this year. The Joe Martin course was hillier and had very technical descents, but I still pulled out a win. I remembered paralyzing fear radiating from my chest every time I approached a descent. Still, my dread of failure and desire to win outweighed my crashing phobia. It is possible to be scared and strong at the same time. No quitting allowed, no matter what. We all wanted to win. Somewhere in the distance we saw signs of the finish and held a quick, steady pace to cross the line—what a relief. All I could say to my teammates was, "Dude, that was EPIC. I love rain!". Team time trials have got to be one of the hardest events in cycling—you either think that you are the weakest link or that you are superman. In the end it really is a race a truth, a true reflection of a team's strength though unity. I'm so proud of us for meeting our goal of clocking the day's fastest women's time and becoming this year's Cat 3 state champions!